A group of fairies lived in a rose garden. Pink, yellow and white petals filled the air with their aromatic scent. The fairies spent their days riding on the backs of butterflies, bumblebees and dragonflies, or chasing ladybugs and grasshoppers. Every day was filled with fun. The biggest worry the fairies had was that a robin or bluebird might eat them. One morning the fairies woke up and climbed out of their rosebud beds to find the sky full of dark gray clouds. The raindrops fell and the fairies had to hide under mushrooms and toadstools. A wind blew and the fairies had to hold onto the mushroom caps or they'd be blown away. 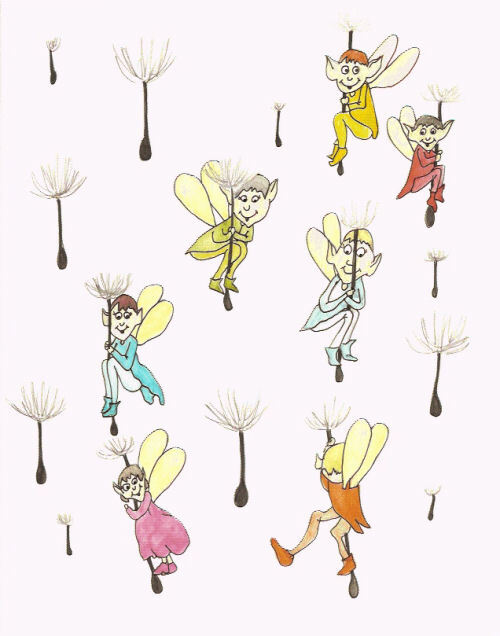 The wind blew harder and harder and the fairies were blown from their lovely garden into a patch of dandelions. They had to hold onto the long stems. Their wings fluttered back and forth, whipped in the wind. Suddenly all the dandelions burst open and thousands of seed helicopters flew into the air. The fairies tumbled through the sky, each grabbing one of the helicopters. The wind finally died down and the rain stopped. The sky was filled with dozens of fairies floating to the ground. It was raining fairies. Slowly they landed in the grass, the helicopters blew away again into the clouds. A rainbow spread across the blue sky. The fairies wiped the raindrops off their wings and flew back into the rose garden. Because of all the rain, the flowers grew bigger and bloomed even brighter.